Jessica Andrade wants her shot at the strawweight championship after she demolished Karolina Kowalkiewicz at UFC 228 on Saturday night. 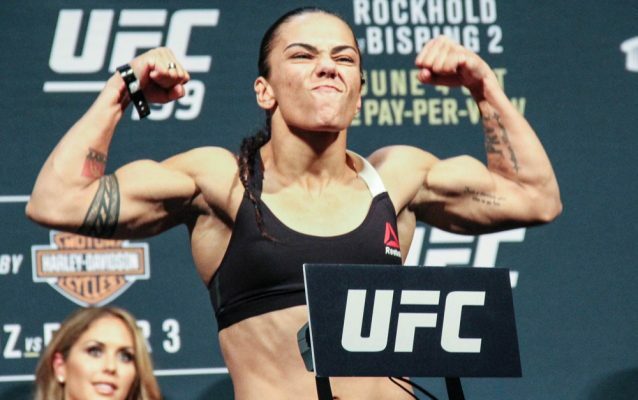 Jessica Andrade is ready for her title shot. The Brazilian tank wanted to make a statement on Saturday night and that’s exactly what unfolded as she absolutely demolished former title contender Karolina Kowalkiewicz at UFC 228 in Dallas. As soon as the fight got started, Andrade charged across the cage like a hunter stalking her prey and she was quick to unleash hell on Kowalkiewicz with a blistering series of punches that came in fast and with a ton of power. Andrade stunned Kowalkiewicz during that first exchange but to her credit, the Polish fighter survived the barrage and was able to reset in the center of the Octagon. From there, Kowalkiewicz actually managed to land a few stiff straight punches as she tried to use superior technique to slow down the aggressive power game coming from Andrade. Unfortunately for her it was short lived success as Andrade took a second breath and then stormed forward with another overwhelming combination of punches. The final shot landed like a bomb exploding in Kowalkiewicz’s face as Andrade’s right hand landed flush and the top five ranked strawweight dropped like a rock to the canvas as the referee quickly swooped into stop the fight. The end came at 1:58 into the first round. Afterwards, Andrade made it clear that with a three fight win streak — with all of those victories coming against top five ranked opponents — that she wants her next fight to come against strawweight champion Rose Namajunas. Considering the three wins in a row she’s put together, Andrade has seemingly done more than enough to get a shot at Namajunas either later this year or in early 2019. Now it’s up to the UFC to make that call if they will grant Andrade’s wishes to fight the champion at UFC 232 in December.